Draper Mercantile and Trading Company presents Hoot and Holler! A Storytelling Event on Thursday, September 21, 2017. 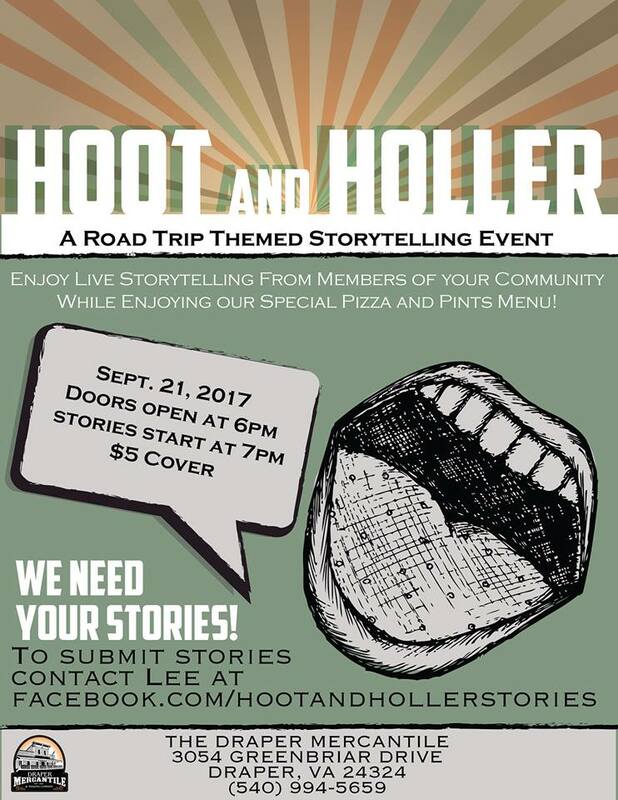 Join us for an evening of storytelling, pizza, beer and friends. Sit back and listen to stories or submit your own to get up on the Merc stage and perform. The theme for this evening will be "Road Trips." To submit your story for approval, please send it over to Lee, our host and MC for the evening. Please visit: https://www.facebook.com/hootandhollerstories/ to learn more about "Hoot and "Hollar!" Menu for the evening is our pizza and pints menu. There is a $5.00 cover charge. Doors open at 6:00 pm and stories will begin at 7:00 pm. To view the event flyer, visit: https://i.imgur.com/z4A2sUL.jpg. For more information, visit: http://www.DraperMerc.com or https://www.facebook.com/DraperMerc or call 540-994-5659.